1) Caplan A. Certain unusual radiological appearances in the chest of coal-miners suffering from rheumatoid arthritis. Thorax. 1953 Mar;8(1):29-37. 2) Schreiber J, et al. Rheumatoid pneumoconiosis (Caplan's syndrome). Eur J Intern Med. 2010 Jun;21(3):168-72. 3) Gough J, et al. 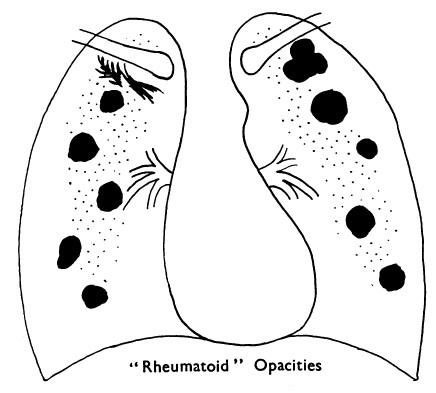 Pathological studies of modified pneumoconiosis in coal-miners with rheumatoid arthritis; Caplan's syndrome. Thorax. 1955 Mar;10(1):9-18. 4) Pernis B. Silica and the immune system. Acta Biomed. 2005;76 Suppl 2:38-44. 5) Erasmus LD. Scleroderma in goldminers on the Witwatersrand with particular reference to pulmonary manifestations. S Afr J Lab Clin Med. 1957;3(3):209-31. 6) Innocencio RM, et al. Esclerose sistêmica associada à silicose pulmonar: relato de caso. Rev Bras Reumatol. 1998;38(4):249-52. 7) Costallat LT, et al. Pulmonary silicosis and systemic lupus erythematosus in men: a report of two cases. Joint Bone Spine. 2002;69(1):68-71. 8) Sanchez-Roman J, et al. Multiple clinical and biological autoimmune manifestations in 50 workers after occupational exposure to silica. Ann Rheum Dis.1993;52(7):534-8. 9) Honma K, et al. Rheumatoid Pneumoconiosis: A Comparative Study of Autopsy Cases between Japan and North America. Ann Occup Hyg. 2002;46(Suppl 1):265-7. 10) Colinet E. Evolutive chronic polyarthritis and pulmonary silicosis. Acta Physiother Rheumatol Belg. 1953;8(2):37-41. 1) Rasmussen V. On haemoptysis, especially when fatal, in its anatomical and clinical aspects. Edinburgh Med J 1868; 14: 385-401. 2) Auerbach O. Pathology and pathogenesis of pulmonary arterial aneurysm in tuberculous cavities. Am Rev Tuberc 1939; 39: 99-115. 3) 星野日出男．空洞壁動脈瘤の病理組織学的研究．結核 1952; 27: 419-22. 4) Remy J, et al. Treatment of massive hemoptysis by occlusion of a Rasmussen aneurysm. AJR Am J Roentgenol. 1980 Sep;135(3):605-6. 5) Picard C, et al. Massive hemoptysis due to Rasmussen aneurysm: detection with helicoidal CT angiography and successful steel coil embolization. Intensive Care Med. 2003 Oct;29(10):1837-9. 1) Birt AR, Hogg GR, Dubé WJ. Hereditary multiple fibrofolliculomas with trichodiscomas and acrochordons. Arch Dermatol. 1977 Dec;113(12):1674-7. 2) Schmidt LS, et al. Birt-Hogg-Dubé syndrome, a genodermatosis associated with spontaneous pneumothorax and kidney neoplasia, maps to chromosome 17p11.2. Am J Hum Genet. 2001 Oct;69(4):876-82. 3) Furuya M, et al. Birt-Hogg-Dube syndrome: clinicopathological features of the lung. J Clin Pathol. 2013 Mar;66(3):178-86. 4) Zbar B, et al. Risk of renal and colonic neoplasms and spontaneous pneumothorax in the Birt-Hogg-Dubé syndrome. Cancer Epidemiol Biomarkers Prev. 2002 Apr;11(4):393-400. 5) Butnor KJ, et al. Pleuropulmonary pathology of Birt-Hogg-Dubé syndrome. Am J Surg Pathol. 2006 Mar;30(3):395-9.